Hey, everyone, it’s Andy Gesner from HIP Video Promo, and today we’re thrilled to be spreading the word about the continuing activities of the reborn (and better than ever) Dinosaur Jr. We certainly weren’t the only ones who were thrilled when the band’s classic lineup – guitarist and singer J Mascis, bassist Lou Barlow, and drummer Murph – re-formed in 2005. Nor were we alone in our celebration of Beyond, the first album of new material from the original trio in close to two decades. Professional reviewers, long-time fans, and new listeners alike were blown away by the set; All-Music Guide called it a “flat-out great record”, and marveled at the band’s newfound sense of assurance. Pitchfork raved about it, the NME crowed about it, and the album made its debut in the Billboard Top 100. The group launched a wildly-successful world tour and helped curate the popular All Tomorrow’s Parties festival. It seems almost impossible to believe, but even the old-timers are beginning to concede the fact: a quarter-century into their legendary run, Dinosaur Jr. is doing their best work. That’s an audacious claim to make, especially since the Mascis-Barlow-Murphy lineup recorded some of the true landmark albums of the 1980s. Bug and You’re Living All Over Me were templates for the alt-rock aesthetic that swept through the musical underground (and eventually the mainstream) during the following decade. Kurt Cobain cites Dinosaur Jr. as a primary inspiration, and the Amherst, Massachusetts trio can take pride in knowing that they’re one of the few combos to have ever exerted any influence over Sonic Youth. J Mascis’s heralded guitar sound was imitated by legions of would-be six-string heroes, but never surpassed. When Barlow left the group to lead Sebadoh – a seminal group in its own right – music lovers assumed that a magic chapter in the rock story was finished. Yet now they’re back, and as the lead single from the upcoming Farm demonstrates, they’re firing on all cylinders. “Over It” might be the catchiest thing they’ve ever recorded – a winning slice of fuzz-rock that Ground Control Magazine calls “the most infectious piece of power pop to be released in years”. Don’t let the song’s hummable quality fool you: the riff that motors the song is every bit as thunderous as those on You’re Living All Over Me. Better yet, the tone is pure Dinosaur Jr. — J Mascis’s overdriven guitar distilled to its primeval essence. 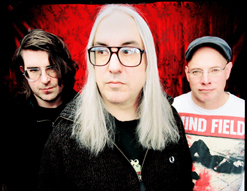 Mascis’s sound is so muscular and so menacing that it’s occasionally been lost on casual listeners that Dinosaur Jr. consists of genuinely playful guys. True fans know, though, and they won’t be surprised at all by the “Over It” video. Shot while the band is on tour, the members of the trio take to the streets of Jacksonville, Tallahassee,Gainesville and Augusta, disrupting the Southern tranquility with BMX bicycles and skateboards, and crash through the corporate parks with the same sort of enthusiasm that they normally reserve for their concerts. They jump, they do tricks, they fall off their wheels, kick and curse their rides, and, undaunted, get back up on them for more. It’s a metaphor for the band reunited, of course, but it’s also a shocking display of energy and nerve. In one memorable sequence, Mascis skateboards across a table backstage, upsetting drinks, snacks, and patrons, too. Look closely and you will even see the legendary Mike Watt hanging out with the band. Provocateurs they always were – and always will be. And in a nod to what a good bunch of guys they are and giving credit where credit is due, they also want everyone to know that the most masterful tricks were actually performed by skate (Kyle Leeper) and BMX (Kenny Horton and Joel Barnett) doubles. It is our greatest pleasure to have the opportunity to team up with Jonathan Cargill and everyone at Jagjaguwar to bring you this must-see video. If you need more info call Andy Gesner at 732-613-1779, or email HIPVideo@aol.com. You can also visitwww.Jagjaguwar.com or www.DinosaurJr.com to find out more about Dinosaur Jr.
Visit JAGJAGUWAR Visit Dinosaur Jr.